By the summer of 1863, Major General John Reynolds was regarded by officers of both north and south as the best general in the Union army. In a confidential meeting on June 2, Lincoln is said to have offered Reynolds command of all northern forces. Reynolds supposedly said he would only accept if he could have free rein and be shielded from Washington politics, conditions Lincoln could not meet. This left Reynolds at front of the Union army when Buford sent urgent messages requesting assistance in holding a strong field position against vastly superior forces. Where many other northern generals would have dithered and delayed, Reynolds understood the gravity of the situation and moved his troops forward with all possible haste. He arrived just in time. After repeated assaults, Buford’s line was ready to break when Reynolds arrived with two corps to counterattack. Buford and Reynolds’s bold moves preserved the Union position on the heights, which in the end decided the battle. Reynolds bought the advantage at the cost of his life, for as he urged his men forward, he was shot through the neck and died instantly. About the time that Reynolds fell, Confederate General Richard Ewell’s troops arrived from the north. Attacked on two sides, the Union forces fell back through the town and reformed on Cemetery Hill. 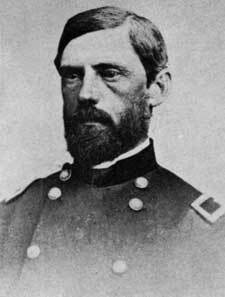 When Lee arrived on the field, he ordered Ewell, who commanded Stonewall Jackson’s old brigade, to take the hill, “if practical.” Jackson undoubtedly would have found it practical. Ewell did not, and also did not send troops to neighboring Culp’s hill, which the northern forces occupied under the cover of darkness. The vision and courage of Union generals Buford and Reynolds, combined with the hesitation of Ewell, gave the northern army a huge advantage in field position after the first day of fighting. John Buford died in December, 1863, in part from the effects of old wounds. On the last day of his life, Lincoln promoted him to Major General in recognition of his service at Gettysburg. Buford asked, “Does he mean it?” and when assured that he did, he said, “It’s too late now. I wish that I could live.” He died in the arms of fellow cavalry officer, Miles Keogh, who would later ride with Custer to his death on the Little Bighorn. This entry was posted in History, Movies, Travel and tagged Civil War, Gettysburg, history, movies, travel. Bookmark the permalink. Reynolds story always makes me so sad. He was the consummate soldier and leader. Eschewing politics and the games of Washington prevented him from taking on the ultimate challenge, but it was the right decision for him. The Union lost a great leader that day.